Form: Slimy sheets up to 4cm x 5cm, or slimy cushions generally surmounted by a short, narrow oscular chimney. Colour: Ochraceous yellow, greyish, yellowish or creamy fawn. Consistency: Fairly firm and elastic. Surface: Slippery, smooth surface, composed of a distinct cuticle. Mottled with pale spots or pores when the sponge is expanded. Apertures: Oscules are sparsely distributed, frequently at the ends of short, cylindrical chimneys. Normally 1 - 2mm wide. Contraction: The oscular chimneys can close up, and the pores become indistinct. Skeleton: No spicules of any kind are present. Sections of the sponge sometimes reveal the presence of a network of fibrils in the soft matrix, helping to strengthen it. Sections cleared in clove oil reveal that the flagellated chambers are elongated (up to 35µm long and about 3µm in thickness) and sometimes branching; typically they radiate from exhalant canals which form the centre of 'aquiferous stars', but during the reproductive period (May to September usually) the aquiferous system tends to become disorganized to the extent that flagellated chambers remain only in the peripheral regions of the sponge. Habitat: On small stones, in the empty shells of lamellibranchs, on the carapace of crabs (e.g. Inachus, Macropodia), at the base of gorgonians, from 10 - 50m depth or more ("80m", Lévi, "300m", Arndt). At Low Water Spring Tide levels on the shore it occurs under overhangs, in fissures and on holdfasts of Laminaria. At mean tide levels it is found under stones and boulders. 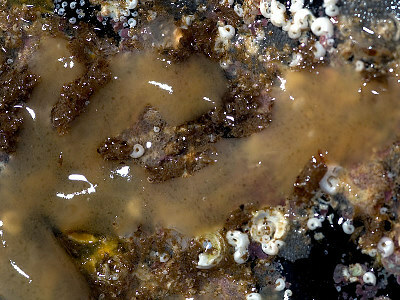 In rock pools it may occur on Fucus serratus and Ascophyllum nodosum, but possibly a different species is involved here (see below). Distribution: Atlantic coasts of Europe; Mediterranean; etc. Identity: Superficially these thin slimy sheets, greyish brown in colour, can be confused with Hymedesmia brondstedi, but the absence of spicules distinguishes Halisarca from Hymedesmia brondstedi. It can also be easily distinguished from the other 'slime sponge', Oscarella lobularis, by the presence of a superficial cuticle, the absence of small lobules on the surface and the presence of elongated, not spherical, flagellated chambers. It is much more difficult to separate Halisarca dujardini from Halisarca metschnikovi Lévi, 1956:87; these can only be distinguished by minute details of gametogenesis and larval development. Details are given in the following Table. Halisarca metschnikovi occurs on Fucus serratus and Ascophyllum nodosum at the mouths of estuaries (Lévi).